The Cubs and Kyle Hendricks stole Game One from a dominant Stephen Strasburg, which makes winning Game Two a bit less desperate. Strictly speaking, the Cubs already got their one required win in Washington, and this is not a must-win game. That’s a boring way of thinking, though, and today the Cubs are in position to take a truly commanding lead of the series. The Cubs have been on fire for almost three months now—they’re now 27 games over .500 since the All-Star break—and if the Cubs win today, there is every likelihood they will find a way to advance to their third straight NLCS. Crazy. 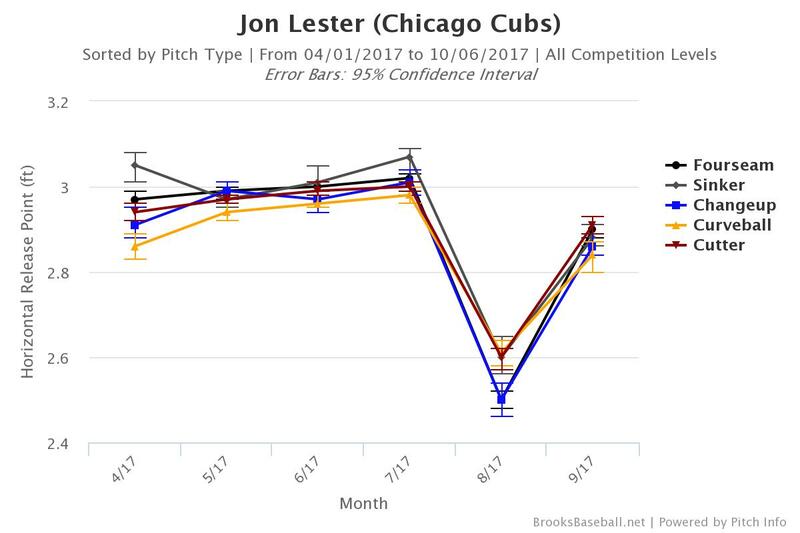 Jon Lester’s struggles since his return from the DL have been fairly well-documented, but when viewed in aggregate, it hasn’t really been *that* bad. In September, Lester threw 32.1 innings with a 4.18 ERA, 25 strikeouts, and admittedly too many (14) walks. The walks were largely responsible for Lester going five innings or less three times, but he really only blew one time, against the Rays in St. Petersburg. Lester is 33 now, and he is no longer the kind of pitcher that you automatically expect to give you seven excellent innings in the playoffs. In today’s game, however, that’s not what the Cubs need. They, like most teams, have a deep bullpen and the ability to piggyback someone like John Lackey or Mike Montgomery with Lester—if needed. There is, of course, the chance that Lester will do what he’s done over and over again in the postseason and be excellent. His last outing in St. Louis on September 30 was promising (7 strikeouts and no walks in five innings), and I wouldn’t bet against him rounding into October form. His velocity, promisingly, ticked back up slightly in September to his mid-summer levels. One day, Lester will fall off, but for now, there are still signs of him being himself. As long as that’s the case, I’ll be okay with the Cubs running him out there in the postseason. His opponent, Gio Gonzalez, poses yet another tough matchup. 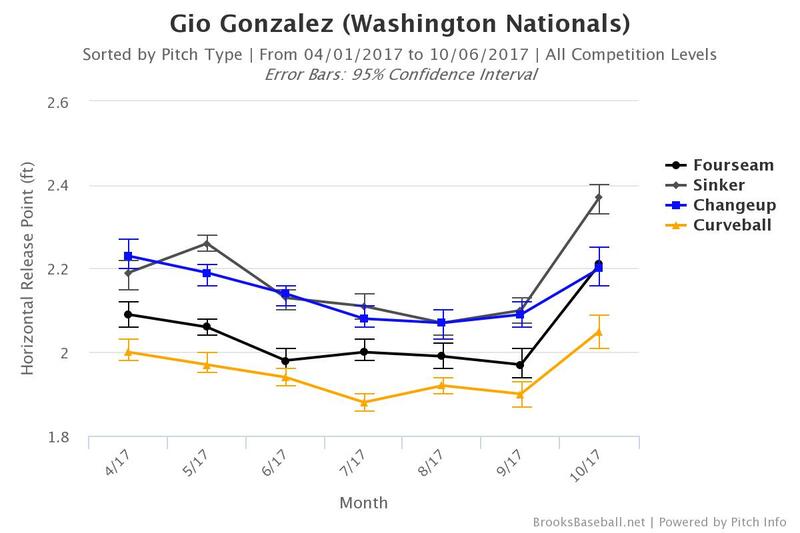 Gonzalez is coming off his best season since at least 2012 (when he put up 6.1 WARP), and the 32-year-old southpaw has an excellent four-pitch fastball/cutter/changeup/curveball mix that has made him a solid staple in the Nationals’ rotation for the last five years. This year, his results have gotten him some deserved outside consideration as a Cy Young candidate. His 8.42 K/9 rate and 3.54 BB/9 rate aren’t great, but they are good, and when he’s on, he commands the zone and gets weak contact. 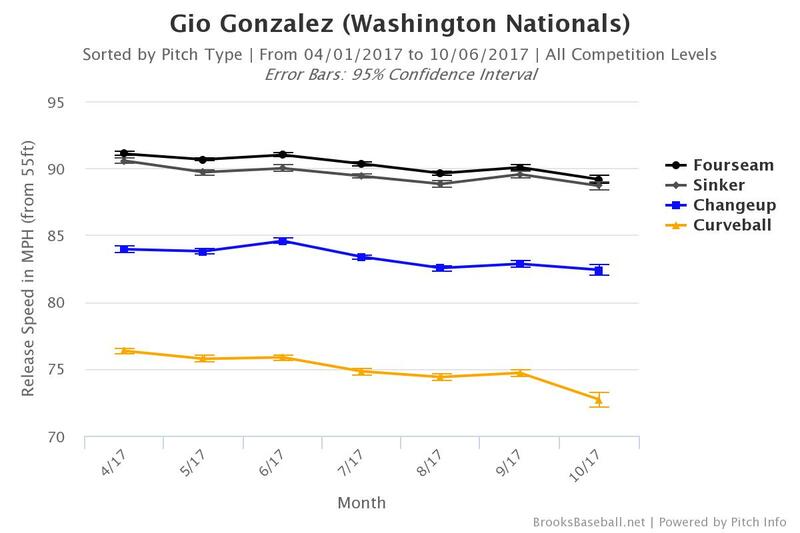 But while they should, of course, respect him, Gonzalez isn’t a pitcher the Cubs should fear in the same way as Strasburg and Max Scherzer. His 8.42 K/9 rate and 3.54 BB/9 rate are good but not great, and when he’s on, he commands the zone and gets weak contact rather than blowing batters away. This is the kind of guy the Cubs should (and have) hit when they stay within themselves at the plate. 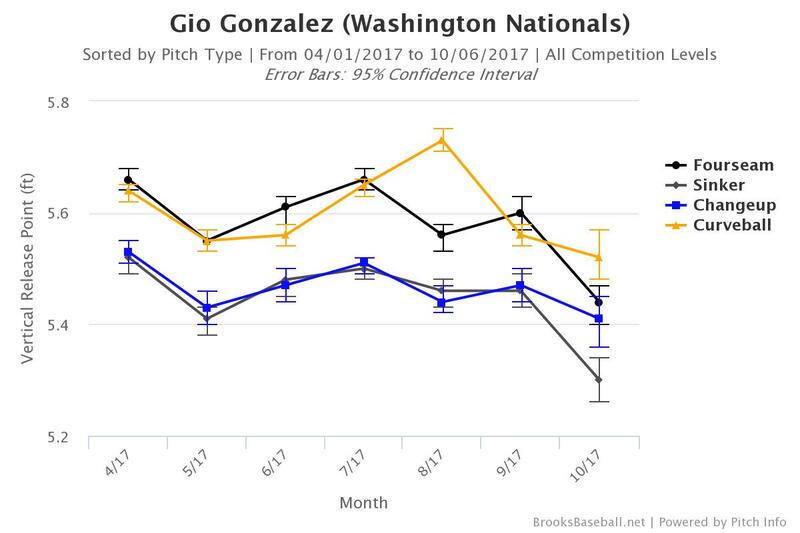 Gonzalez actually had a worse September than Lester did, with a 5.47 ERA and only one start that lasted more than five innings. His last start, on October 1st against Pittsburgh, will have worried some Nationals fans. While he could have simply been trying to save himself, his velocity was noticeably down, and his release point was noticeably different from the level he has been at for the rest of the season. He only made it through 4.1 innings, and he gave up six earned runs with only two strikeouts. There’s less distance between these two lefties than their season results might suggest, and few results from either pitcher would be shocking. 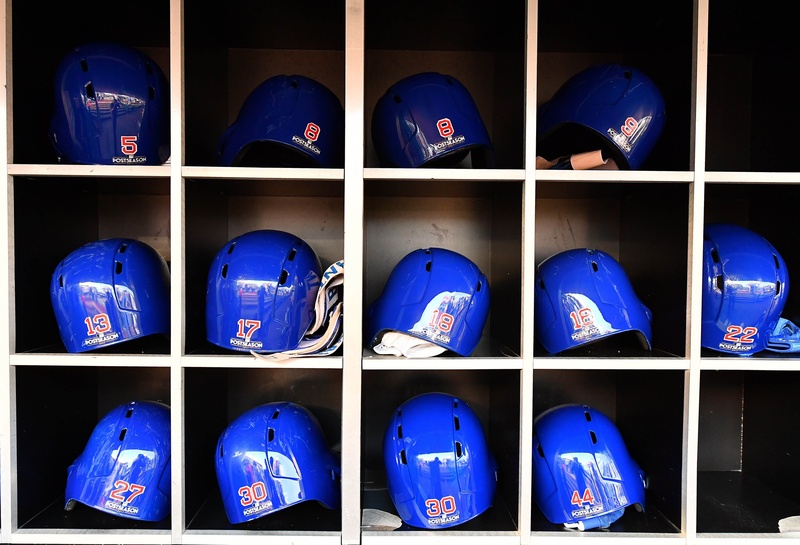 – The outfield alignment the Cubs opt for will be interesting against the lefty Gonzalez. It seems like a good day to spell Jason Heyward and perhaps get Albert Almora Jr. (who has crushed lefties this year) a start in center. Ian Happ replacing Ben Zobrist or Kyle Schwarber is another possibility, with Schwarber probably the more likely to sit out. As he has much of the year, though, Zobrist struggled at the plate last night, and I wouldn’t be shocked to see him out of the lineup or at least out of the leadoff spot. – Bryce Harper looked a bit hobbled after diving for an Anthony Rizzo single in the sixth last night, and since returning from a hyperextended knee a week ago, he’s managed just four hits—all of them singles. He’s still a very dangerous hitter, but it seems likely that he’s not operating at full capacity right now, and the Cubs pitchers might attack him accordingly. – I’ll be the first to mention it, and I’m sure that Ernie Johnson will follow me up tomorrow as soon as the Nationals have their first baserunner, but Jon Lester occasionally has trouble throwing to bases. He’s managed his yips for three years now, somehow, but don’t be surprised if Trea Turner drops down a bunt or two tomorrow. 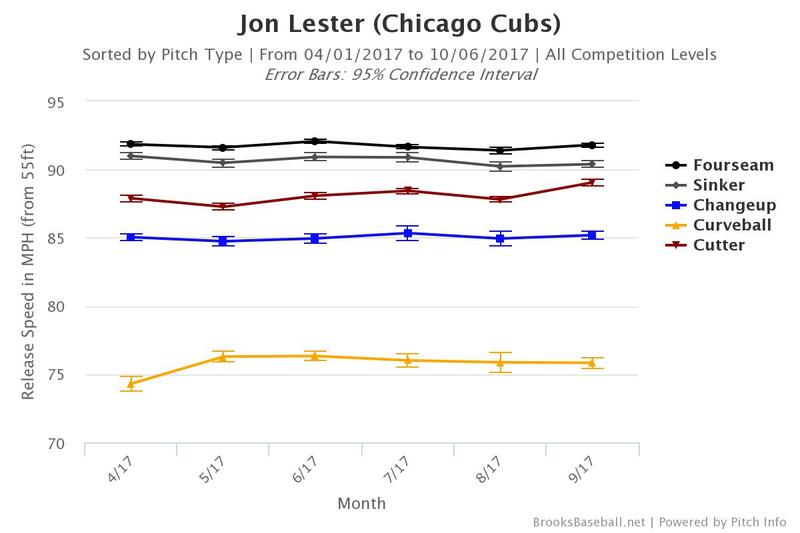 It would certainly make sense if Lester looks good early on. – Willson Contreras hasn’t homered or hit for much power since returning from his injury. That is either going to change very soon, or the lingering injury is still bothering him enough to make sure that it doesn’t. I’ll bet on the former. First pitch is 4:38 CT on TBS.